The Nikon EDG 8x32 provides a big, beautiful image, with no discernible chromatic aberration and with a 410-foot field of view. Its resolution score was excellent (4.6), and the binocular won a "Wow!" from several judges. It has an exceptionally smooth and precise focus knob, great ergonomics, with superb balance. The barrels curve out to enclose the strap lugs and protect the hand. The EDG has the longest eye relief (18.5 mm) of any of the top-scoring binoculars, making it the most glasses friendly. The diopter, on the center column, locks and has a scale. However, it's unusual. Instead of using the focus knob, you turn a knurled ring beneath its base. It wasn't rated quite as highly as the focus-knob solution of other top binoculars in our study. 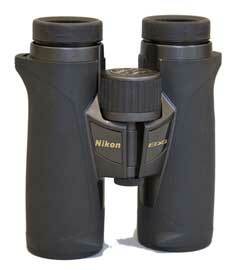 Pro: Excellent optical quality and ergonomics; unsurpassed focus knob; most glasses friendly. Con: Awkward diopter adjustment mechanism. Expensive. Not available yet from Nikon.